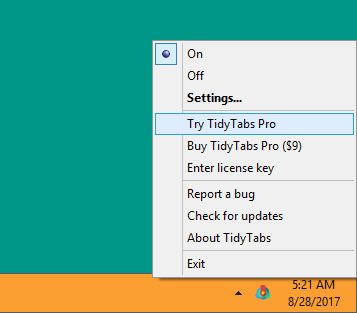 Right-click on the icon in the System Tray and choose Try TidyTabs Pro. You are now in trial mode, all the features of the Professional Edition are unlocked for 60 minutes (renewable). At the end of the trial period, you will be offered to purchase TidyTabs Professional Edition or to continue with the Personal Edition. 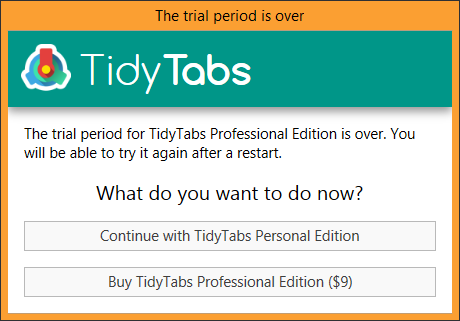 Note: If you need more time to evaluate TidyTabs Professional Edition, you can close and restart TidyTabs at the end of the trial period and repeat this procedure to enable the trial mode again.